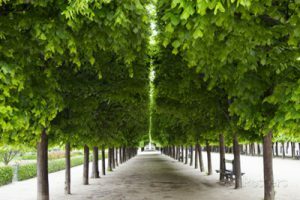 One of Paris’s most serene public parks is one not often visited by tourists to the City of Light—the gardens of the Palais-Royal, directly north of the Louvre in the 1st Arrondissement. 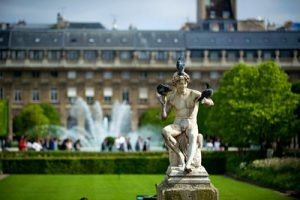 And it’s a shame that it isn’t on more visitors’ to-do lists, because its beautiful fountain, gorgeous landscaping and iconic double rows of perfectly manicured trees lining long promenades combine to create a quintessentially Parisian garden. Why is it such a secret gem? First, the Palais-Royal itself is not commonly visited by tourists—or even Parisians themselves. The building today is home mostly to a host of French bureaucracies and administrative offices. 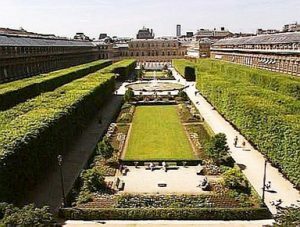 And second, the garden—though very large in size—is part of an entirely enclosed courtyard in the center of the Palais-Royal complex, making it nearly invisible to passers-by. If you don’t know exactly where to look, you can easily miss it. And that’s truly unfortunate, since the space is tranquil and exquisite. The Palais-Royal, originally called the Palais-Cardinal, was designed in 1629 by architect Jacques Lemercier and constructed between 1633 and 1639 to serve as the personal residence of Cardinal Richelieu, a Roman Catholic cardinal who served as the chief minister to France’s King Louis XIII. Richelieu, however, lived in the palace for only a few years, and upon his death in 1642 the facility became the property of King Louis XIII—and as a result of its new ownership was renamed Palais-Royal. The palace soon became a sort of revolving-door residence for European royalty and aristocracy. After Louis XIII died in 1643, the palace became the official residence of Anne of Austria, the wife of Louis XII, and her sons, including the future king Louis XIV. But their stay lasted only six years, and in 1969 the building became home to Henrietta Maria and Henrietta Anne Stuart, the wife and daughter of the deposed King Charles I of England who had fled the country during the English Civil War (Charles was executed). Henrietta Anne was married off to King Louis XIV’s younger brother, Philippe de France the Duke of Orleans, and the palace became their main residence. It was Henrietta Anne, now known as the Duchess of Orleans, who created the palace gardens, which served as the social center of Paris (while the nation’s primary playground for the aristocracy was just outside Paris in Versailles). After Henrietta Anne died in 1670, the duke remarried and his new wife preferred to live in the Chateau de Saint-Cloud just west of Paris, and the seat of the House of Orleans was moved there. 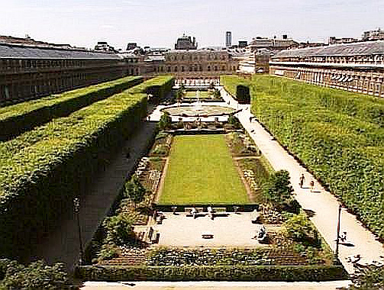 The Palais-Royal enjoyed a bit of a rebirth in terms of its social standing in the late 1600s and early 1700s. Francoise d’Aubigne (the Marquise de Maintenon, known most commonly as Madame Maintenon), the paramour to King Louis XIV and eventually his second wife (although the marriage was deemed “morganatic,” meaning that she was never openly acknowledged as the king’s wife and would never become queen), decreed that all social activities be shifted from Versailles to the Palais-Royal. When Louis XIV died in 1715, his five-year-old great grandson succeeded him, and while as a child the Duke of Orleans served as the young ruler’s regent, setting up the nation’s government at the Palais-Royal. When Louis XIV became of age, he once again moved his seat to Versailles, and the nation’s aristocracy followed him. 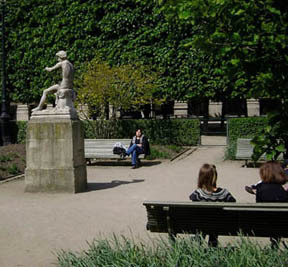 The garden itself began to gain a reputation for illicit activity, including becoming a gathering spot for prostitutes favored by wealthier Parisians and for homosexual aristocrats. In fact, openly gay Jean Jacque Regis de Cambaceres, a longtime compatriot and friend of Napoleon Bonaparte who eventually rose to the rank of France’s second consul, essentially what in the U.S. would be the vice presidency, held nearly nightly raucous gatherings with groups of young gay men in the gardens . These get-togethers were so scandalous that police officials—and even members of Napoleon’s cabinet—regularly encouraged Cambaceres to be more discreet. 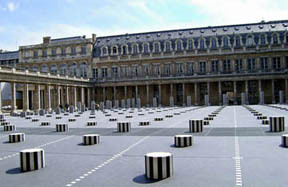 T oday, the Palais-Royal houses the Conseil d’Etat (which provides legal oversight to France’s executive and legislative branches), France’s Constitutional Council and the French Ministry of Culture. The buildings at the rear of the garden are part of the National Library of France. 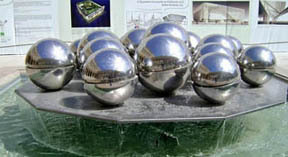 None of these agencies are particularly high on any list of must-see Paris tourist sites (in fact, most don’t permit visitors at all), which explains why the gardens—as well as a large interior courtyard, called the Cour d’Honneur that includes a futuristic art installation consisting of large metal balls and black-and-white columns of varying heights—is rarely seen by visitors to the City of Light. But if you’re in the First Arrondissement, particularly if you’re planning to visit the Louvre (which is literally across the street from the Palais-Royal), it’s well worth the short side-trip to check out these lovely gardens. 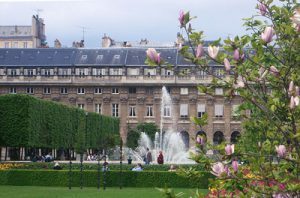 The official address of the Palais-Royal is 8 Rue de Montpensier, which is a tiny street that runs along the western edge of the palace. In actuality, the main entrance to the palace courtyard and gardens is from the Rue de Rivoli between Rue de Richelieu and Rue de Valois (Metro: Palais-Royal—Musee de Louvre). Access to the Cour d’Honneur and gardens is available daily, from 7 a.m. to 8:30 p.m. from January 1 through March 31; from 7 a.m. to 10:15 p.m. from April 1 through May 31; from 7 a.m. to 11 p.m. June 1 through August 31, from 7 a.m. to 9:30 p.m. September 1 through September 30, and from 7 a.m. to 8:30 p.m. October 1 through December 31. Admission is free. In addition to the main entrance to the facility from the Rue Saint-Honore, another convenient entry/exit can be found at the rear of the palace grounds at 9 Rue de Beaujolais. This entry was posted in Beauty of Paris, French history, Hidden Paris, Palaces, Parks and Squares, Right Bank, Royalty and tagged Louvre, Palais-Royal, Rue de Rivoli by Bob Adams. Bookmark the permalink. ha, i’ve never been to Paris, but when I go, the royal gardens are on the list.